I went home to visit my Mum and Dad, and get fitted for my bridesmaids dress (my best friend from school is getting married, and awesome, yet terrifying experience to come this year) a couple of weeks back. My Mum was in need of making some sweet treats of a cakey variety to take on a picnic with some friends. My Mum is an amazing baker, and makes brilliant cakes herself, however she is also a perpetually busy person, with four boys (ok one is a dog, but he still counts) to be looked after in the house, so .... one daughter to the rescue! (Actually I totally stole this task out from under her nose and ran off to find baking ingredients before she could stop me). 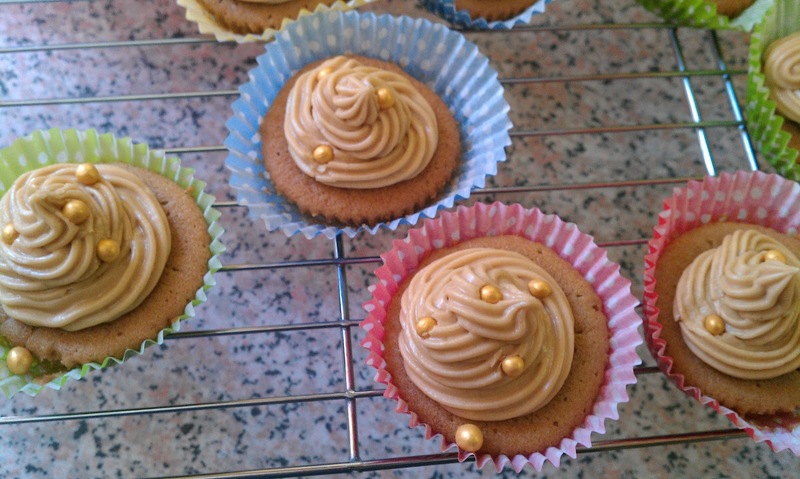 I created some little cupcakes, in four flavours (you've got to cater to all tastes after all!) - Lemon and orange, Chocolate, Vanilla and strawberry and Coffee. I then got busy with play time and rummaged around for some decorating items. I found (ahem my Mum found and gave me) a plastic bag filled to the brim with goodies that she has collected ... my Mum is a little like a magpie at times, not stealing things, but she does have a habit of buying shiny and pretty things, the majority of which then quite often sit in cupboards and drawers for up to 5 years after their expiry date because she has bought too many to use up in that time (but then I can hardly talk, if anything I am so very much worse for the very same habit). I chose a minimal (ish) approach and selected a few fun items to jazz up each of my cake flavours. The Lemon and orange sponges are topped with icing sugar mixed with lemon juice, then sprinkled with citrus flavour strands. 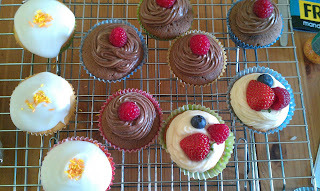 The Chocolate sponge, was topped with chocolate buttercream, and each one then with an upside down raspberry. Vanilla and Strawberry cakes were topped with vanilla buttercream and a little trio of fruit. 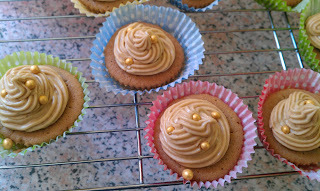 Finally the coffee cakes were topped with coffee buttercream and some golden sugar pearls. They went down well I am told, and I had fun making them, so that is all the important boxes ticked!